If your company recently began using Impraise you may be wondering how it can benefit you and your team. While nothing can replace face-to-face feedback, at Impraise our goal is to enhance and strengthen the feedback interactions currently taking place in your team. Here are 6 ways Impraise can help you drive your team towards high performance with improved communication flows and data. Sometimes meeting deadlines and keeping up with your own workload can get in the way of your coaching responsibilities. Simply remembering to share feedback regularly can have a major impact. Studies show that 43% of highly engaged employees receive feedback at least once a week. 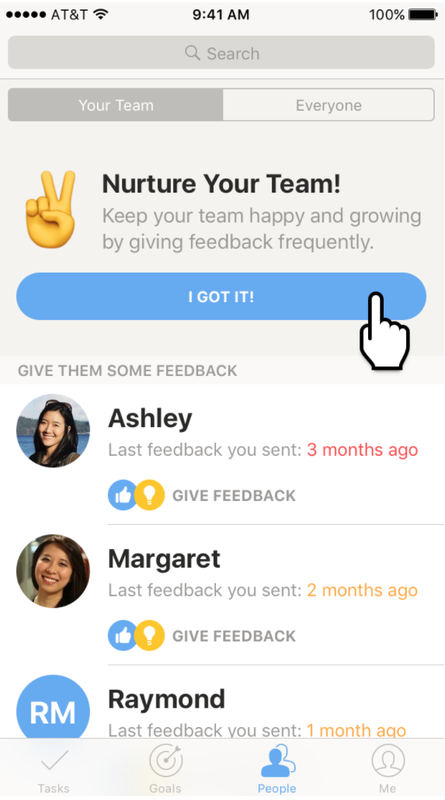 Impraise helps you stay on top of the coaching needs of your team by creating profiles for each team member showing you when you last shared feedback and allowing you to review past feedback interactions. Want to know what you could be doing to become an even better leader? The surprisingly not so secret way of finding out is simply by asking. Impraise allows you to ask your reports for feedback on your leadership skills either in real-time or during a formal manager review. Rather than asking each individual, send one feedback request to your whole team. Remember, it’s not always easy to give constructive feedback… especially to your manager. Starting off sharing it via a tool will give your team time to word it in a way they feel comfortable with. Once they see you’re open to upward feedback, they’ll become more confident sharing valuable insights into your performance face-to-face. 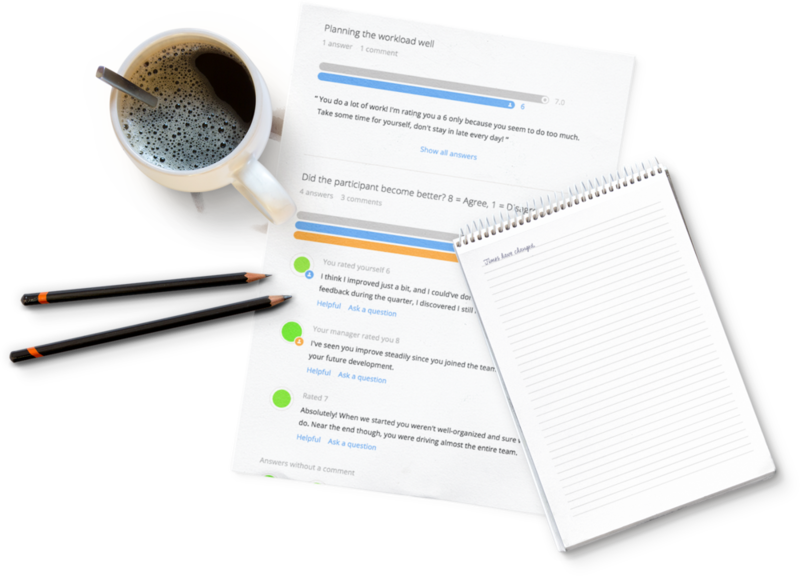 All feedback collected on Impraise is generated into individual performance reports. These reports allow you and your team members to identify hidden strengths and areas for improvement. Use this data to address skill gaps and move your team forward. Unfortunately, fear of feedback is a common problem which can greatly hinder professional development. When not addressed, it can cause emotions to cloud the valuable insights your team members receive from feedback exchanges. You can help your team overcome this tendency by using Impraise to train positive feedback behaviors. For example, have everyone ask for feedback after giving a presentation, at the end of each project or before finalizing a new campaign. Once they become accustomed to asking for and sharing feedback at specific moments, it will eventually become an ingrained habit within the team. The cornerstone of building a trusting and helpful relationship with your team members is the weekly or bi-weekly 1-on-1. Are you both getting the most you can out of these moments? Impraise helps you enrich these conversations by allowing you to review their profile beforehand and see where they’re doing well and where they could improve. This is especially helpful when practicing strengths based performance management. An international Gallup study found that strengths-based workplaces experience up to a 29% increase in profit. Studies have found that high performing teams share nearly six times more positive feedback than average teams. Impraise allows people to share feedback with their peers, reports or manager anytime anywhere. Instead of letting hard work or help go unnoticed, encourage your team to get into the habit of sharing praise. One best practice is to share these pieces of feedback every week at your team meeting to boost team spirit and promote best practices. For more insights into how you can use feedback to motivate, engage and develop your team, check out our free eBook.